The SPAD S.VII is a single-engine single-seat fighter biplane aircraft produced by the by the French Manufacturer SPAD, Societe Pour L'Aviation et ses Derives. The SPAD S.VII was also license built in the UK for the Royal Flying Corps and in Russia. Some SPAD VII were captured by the German troops during WWI and used in combat. 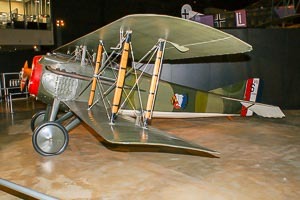 The S.VII (S-7) was also used in large numbers by the United States Army Air Service in WWI.